Construction on 31 Road near the entrance of the Mesa County Landfill starts Friday, Aug. 3. Expect traffic delays. All vehicles accessing the Mesa County Solid Waste Campus, Animal Services, and Fleet, will be rerouted to Hookless Boulevard. View more information at https://bit.ly/2OAcm0o. The Mesa County Landfill will experience traffic delays due to a 90-day road reconstruction project on 31 Road. Residents should anticipate longer wait times during construction and are encouraged to limit the number of trips they take to the landfill during the duration of the project. Improvements to 31 Road will include intersection reconstruction by increasing the length of the road’s vertical curve. 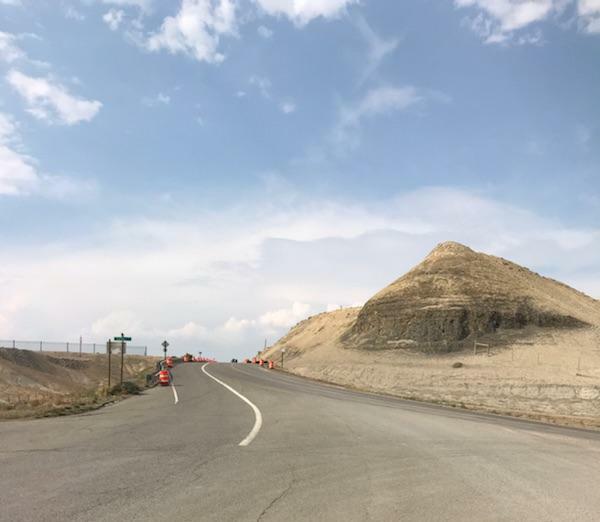 The project will also add a right-turn lane, traffic islands with guardrails, and fence relocation, which will aid in visibility and sight distances for traffic traveling over the hill into the entrance of the Mesa County Composting Facility. Mesa County Commissioner Scott McInnis will lead a press conference Thursday, Aug. 9 at 11 a.m., in the old Mesa County Courthouse, 544 Rood Ave., public hearing room on the second floor, to announce the unified front of the 5-2-1 Drainage Authority, City of Grand Junction, Grand Valley Drainage District, City of Fruita and the Town of Palisade to address the next steps for a solution concerning stormwater drainage issues across the Grand Valley. Read more at https://bit.ly/2vfEvBP. The Mesa County Sheriff’s Office found a neat rock outside their building. The idea is after you paint and decorate a rock you hide in plain sight for people to find then you post it on Facebook (so it's official!) and hide it again! This one is already in its next hiding spot...any guesses? Happy Hunting! 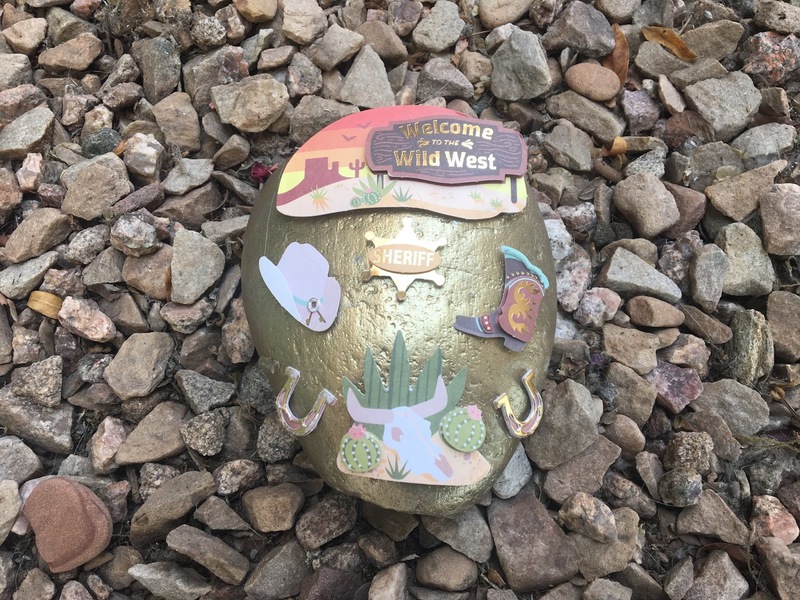 GJ Rocks is a group of community members that spread cheer and positivity by painting rocks and placing them around the Grand Valley. The way it works is if you are out and about and find a painted rock, you can either keep the rock or re-hide it for somebody else to find. Mesa County Sheriff''s Office Deputies, Mesa County Search and Rescue and Lower Valley Fire Protection District responded to a report of a small plane crash in the Colorado River near the Colorado, Utah border. The pilot was transported via helicopter to the hospital. Deputies took a boat upriver and helped secure the Kitfox aircraft at the crash site. The Mesa County Sheriff's Office has notified the FAA and NTSB. A plane crashed in the Colorado River near the Colorado, Utah border Tuesday. The 59-year-old pilot was airlifted to a hospital after rafters helped bring him to rescue crews. The Mesa County Clerk and Recorder's Office hosted a "Dog Days of Summer" team building and appreciation potluck for staff. Mesa County Commissioner Rose Pugliese speaks to the Associated Members for Growth and Development on the potential Mesa County ballot measure exempting state grants from TABOR. 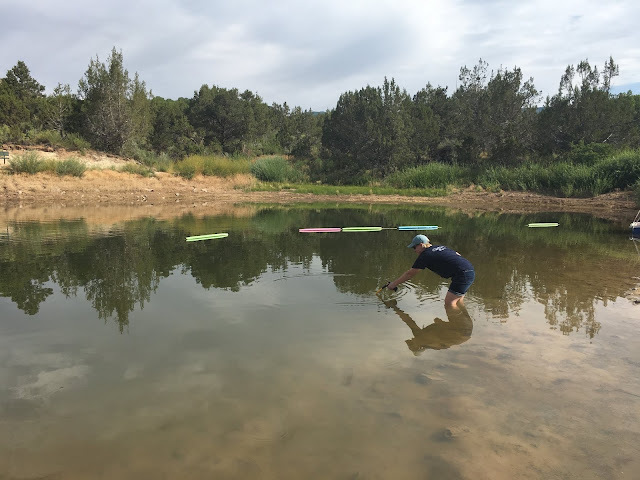 Melissa Salter with Mesa County Public Health gathers a water sample for testing. MCPH Health Promotion Specialist Katie Smith interviews with KREX News Channel 5 about the Fruita Youth Initiative. Installation of a geosynthetic clay liner system continues at the Mesa County Landfill. This project is meant to allow the landfill to move to a new cell within the current landfill's footprint for the disposal of waste. Crew members roll out and install the liner at the landfill. The liner retards migration of leachate and its toxic constituents to prevent contamination of underground water. open and ready for registration on AUGUST 8, 2018.
at 1-877-361-7375, or this office [970-244-1833; 970-244-1829]. What is a Tax Lien? A tax lien represents a lien of unpaid real estate taxes, assessments, penalties, advertising costs and fees. Investing in tax liens through purchase at a tax lien sale is just that—an investment, earning interest on funds invested. You purchase the tax lien, not the property. 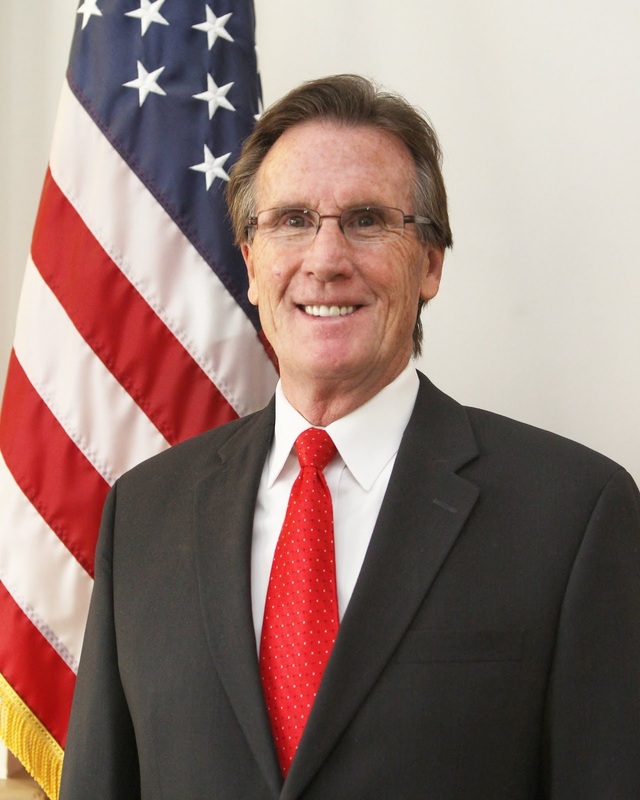 Mesa County Commissioner Scott McInnis will lead a press conference Thursday, Aug. 9 at 11 a.m., in the old Mesa County Courthouse, 544 Rood Ave., public hearing room on the second floor, to announce the unified front of the 5-2-1 Drainage Authority, City of Grand Junction, Grand Valley Drainage District, City of Fruita and the Town of Palisade to address the next steps for a solution concerning stormwater drainage issues across the Grand Valley. Representatives from each agency, including the Grand Junction Chamber of Commerce, will address their priorities and efforts as they move forward with a mission to create one authority under a new structure to appropriately handle stormwater improvements. 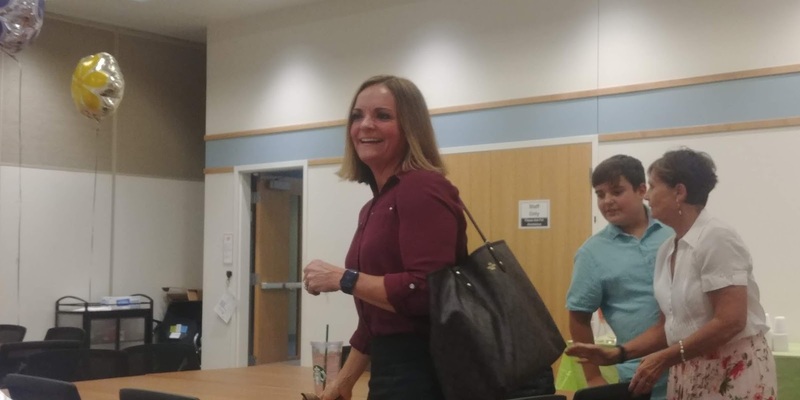 “The Grand Junction Area Chamber has consistently advocated for a valley-wide solution to a valley-wide problem and look forward to the thoughtful consideration of options that will work for everyone including our businesses to address this critical infrastructure need,” President and Chief Executive Officer of the Grand Junction Area Chamber of Commerce Diane Schwenke said. The press conference will be held in the old Mesa County Courthouse, 544 Rood Ave., on Thursday, Aug. 9 at 11 a.m. The Mesa County Solid Waste Campus will experience traffic delays due to construction on 31 Road, which begins Friday, Aug. 3. All vehicles accessing the campus at 3071 US Highway 50, including the Organic Materials Composting Facility, will be rerouted to Hookless Boulevard. Message boards have been posted on Highway 50 and facility signage to direct customers to the campus. Residents should anticipate longer wait times during construction and are encouraged to limit the number of trips they take to the landfill during the next 90 days of construction. Improvements to 31 Road will include an intersection reconstruction by increasing the length of the road’s vertical curve. 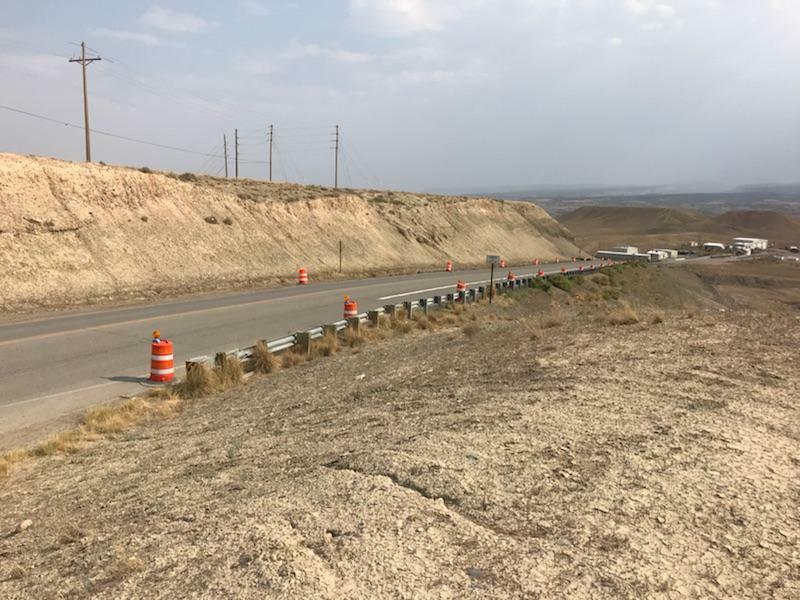 The project will also add a right-turn lane, traffic islands with guardrails, and fence relocation, which will aid in visibility and sight distances for traffic traveling over the hill into the entrance of the Mesa County Composting Facility. Traffic for both the Mesa County Landfill and the compost facility will be directed to go across the landfill’s scales and utilize the landfill’s main haul road. Solid Waste Management asks patrons to be patient with staff at the scale house and be mindful of others during their visit to the Solid Waste Campus. The speed limit at the landfill is 15 mph and will be enforced. Passing other vehicles on the main haul road is prohibited. 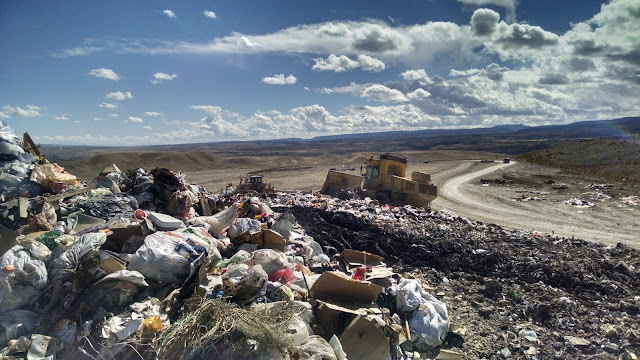 Mesa County Landfill’s vehicles and equipment have the right of way. “Our goal is to keep customers safe. That is why we are making these much-needed changes to 31 Road, and that is why we are advising patrons of both the compost facility and the landfill to limit their visits to the Solid Waste Campus until construction is complete.” Richardson added. Karin Vanderminden and Don Clements work on a Saturday to prepare for a software conversion the Motor Vehicle Office will be experiencing starting Aug. 1. From left to right: Amanda Golightly and Adrianna Murrieta-Barcelo work Saturday morning in preparation of the statewide Motor Vehicle and Driver License Office closures, which allow the State of Colorado to replace the Colorado State Titling and Registration System (CSTARS), originally installed in the 1980s, with a new system, Colorado DRIVES, allowing for better county-to-county integration, faster transaction processing and additional online services. 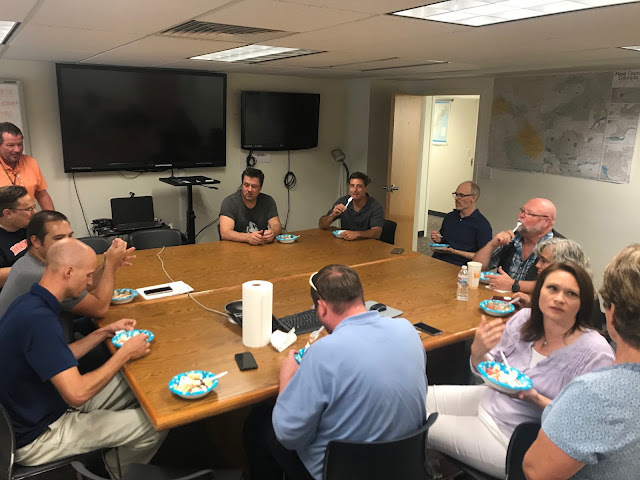 From left to right: Matt Vigil, Greg Stmartin, Conrad Cole prepare for data conversion and software updates by the State of Colorado. 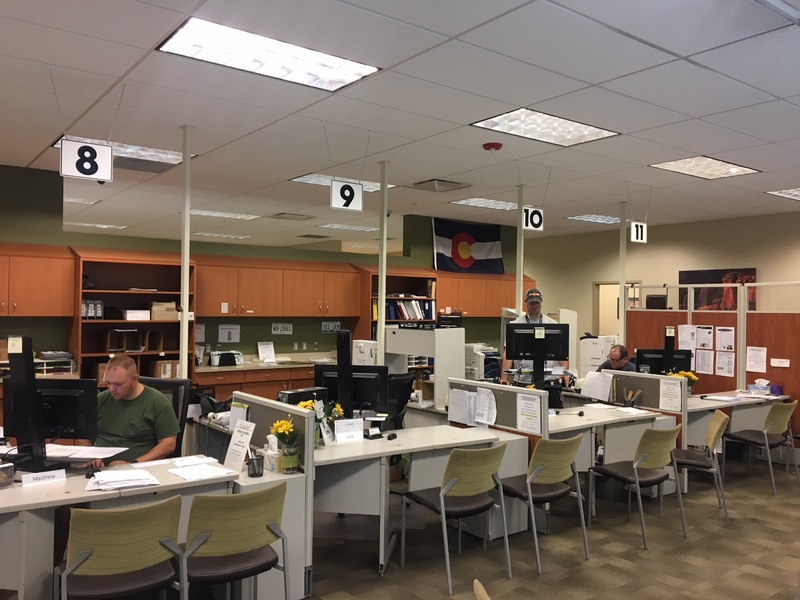 All Colorado title and registration services, including motor vehicle registration renewal, vehicle titling, International Registration Plan (IRP) and ownership transfers will be unavailable in-person August 1-3, 2018, to allow for data conversion and software updates by the State of Colorado. 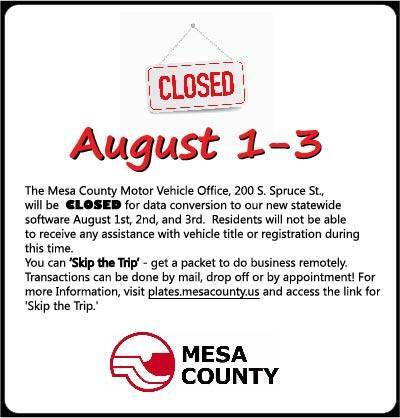 Learn more, at http://blog.mesacounty.us/2018/07/motor-vehicle-office-will-be-closed-aug.html. Mesa CountyAssessor’s Office Appraiser Shirley Shaw volunteered at the HomewardBound of the Grand Valley Homeless Shelter’s annual concert fundraiser where she met a resident in need. The shelter has worked with the resident who is now transitioning into an apartment. The person does not have the resources to furnish their new home. Shaw took matters into her own hands and sent out an email request to her co-workers asking for anything at all, even just small items they would like to donate. Shaw was able to deliver a few boxes of goodies and a couch. Mesa County Assessor Ken Brownlee and Appraiser Shirley Shaw pause for a picture as they load up items donated from employees to be gifted to a community member in need. Mesa County Sheriff Matt Lewis, right, visits with an Inside Mesa County (IMC) class participant at a meet-and-greet Monday morning. Mesa County Assessor Ken Brownlee chats with a few IMC members before their graduation gets underway. Mesa County Clerk and Recorder Sheila Reiner, center right, congratulates soon to be IMC graduates. Mesa County Commissioner Rose Pugliese, right, thanks class participants for their commitment to learning more about county government. Mesa County Commissioner John Justman, left, welcomes IMC students to the meet-and-greet breakfast before he officiates the administrative public hearing. Mesa County Commissioner Scott McInnis, right, converses with IMC member Dustin Wells Monday morning. Several Mesa County elected officials and department heads stopped by to celebrate with IMC graduates for embarking on a nine-week journey to learn more about the internal functions and operations of Mesa County government. The Board of Mesa County Commissioners recognizes the 2018 Inside Mesa County graduates for furthering their county government knowledge. Participants were recognized for their dedication in completing a 9-week course that helped them acquire a deeper knowledge of their Mesa County government. Classes included interactive presentations from elected officials and county departments as well as tours of several Mesa County facilities. Inside Mesa County participants were awarded a Certificate of Recognition during the Board of County Commissioners' public hearing for their dedication and willingness to further their awareness of the internal operations and financial responsibilities of county government. Certificates of Completion were issued to the following: Matt Soper, Dusti Reimer, Victor Yahn, Greg Olson, Tina Peters, Dustin Wells, Nina Anderson, Candace Carnahan, Marjorie Haun, Jennifer Seal, Deborah Erbisch, Mark McCallister, Mary McCallister, Laureen Gutierrez, Andrew Weber, Matthew Breman, Sarah Kieran, Gina Thompson, Jennifer Murrell, Lori Buck, JJ Fletcher, Bob Erbisch. Chairman of the Board of Mesa County Commissioners, John Justman, thanks 22 residents who graduated from the Inside Mesa County class. The Board of County Commissioners convened on Tuesday to vote on land-use items. To see what they voted on, visit http://sire.mesacounty.us/sirepub/mtgviewer.aspx?meetid=386&doctype=AGENDA. Mesa County Administrator Frank Whidden meets with United Way of Mesa County Campaign Co-chair Kristi Bennett Adams and Cabinet Member Michelle Trujillo to celebrate the support Mesa County employees give to United Way and the community. 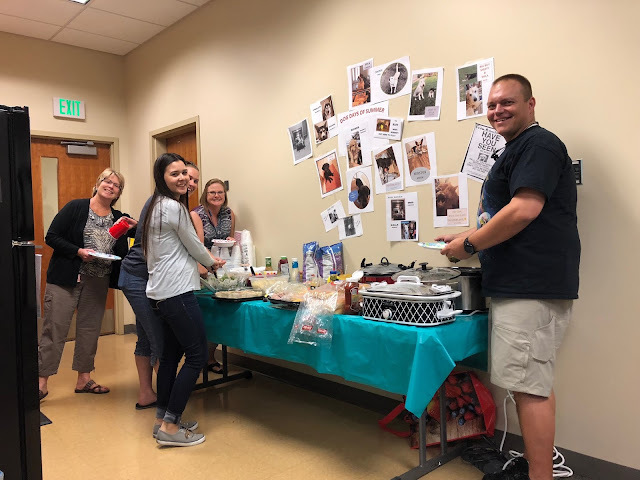 Wednesday afternoon, Mesa County Information Technology (IT) personnel got together for team building and fun over the lunch hour. 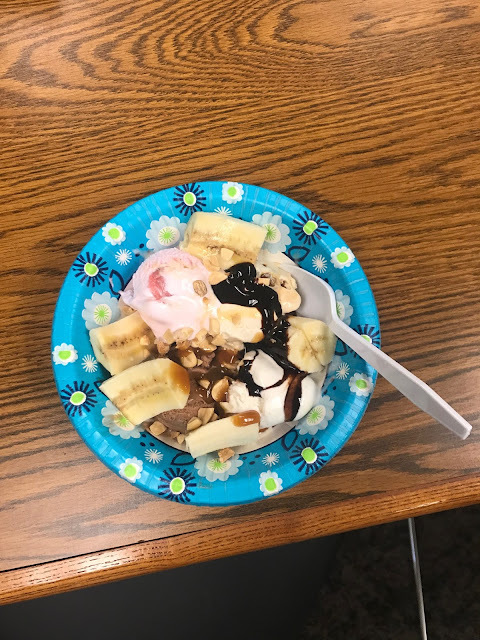 Each member of the IT team brought an ingredient to make a banana split. Go, teamwork! The Mesa County Fair kicked off Tuesday, July 24, 2018. A coloring wall welcomes fairgoers. Mesa County Commissioner John Justman stops by the Mesa County Fair Tuesday morning. 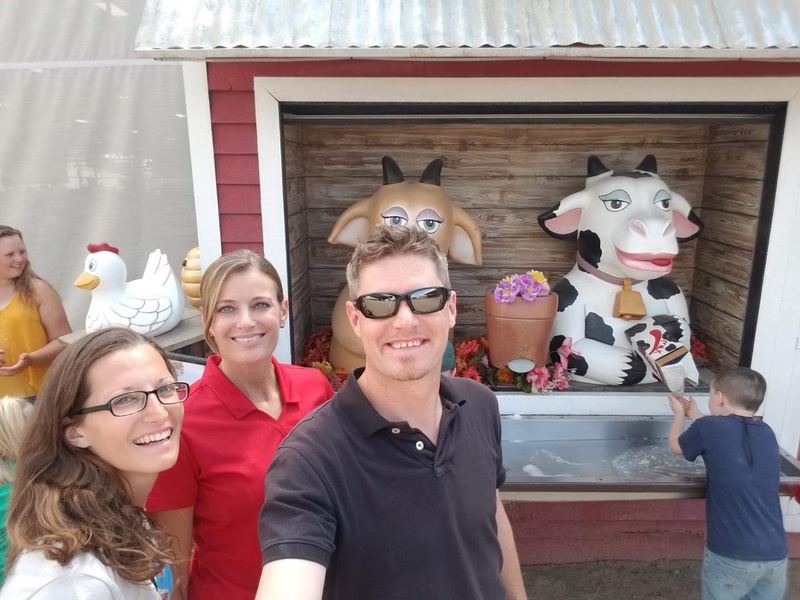 Admission to the Mesa County Fair was free this year. 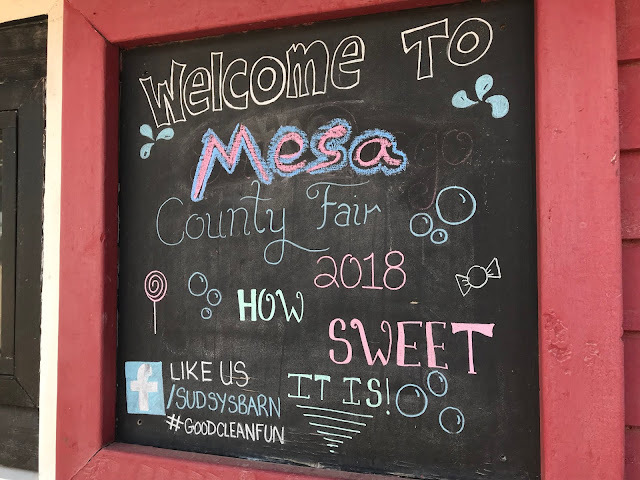 See what went on, at mesacountyfair.com. Have you tried walking on water? Mesa County Commissioner Rose Pugliese, right, races Mackenzie Dodge on a tractor at the Mesa County Fair. There is fun for the entire family at the fair, including amusement carnival rides. Mesa County Fairgrounds Manager Donna Redd (driver) makes sure everything is under control and well-taken care of at the fair. She is the glue that keeps everything together. The Sudsy’s Barn hand washing station is way more fun than your average hand wash! A 4-H youth prepares for the sheep show at the Mesa County Fair. Fun at the fair last week. 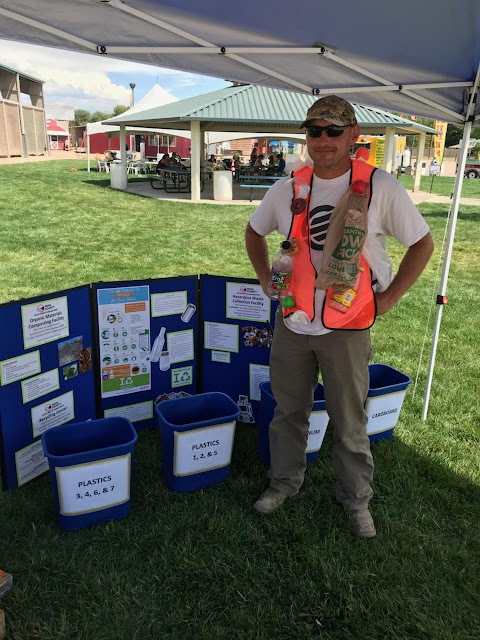 Mesa County Public Health talks with fairgoers about hand washing and mosquito prevention. Have a blast, but be sure to wash your hands! Even completely healthy animals can carry germs that can make you sick, be sure to wash your hands. Mesa County Public Health hosted an informational booth at the Mesa County Fair, right in front of the fair office. 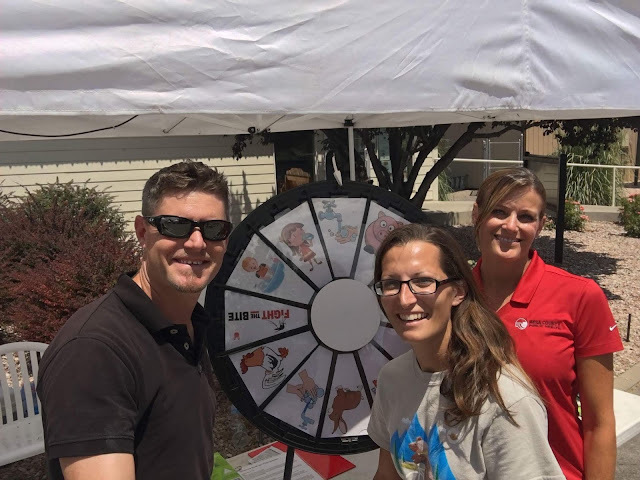 Residents had the opportunity to spin the wheel to test their health knowledge for a chance to win a prize. A Mesa County Fair Ambassador helps a resident to her car. The "Grizzly Experience," a grizzly bear show at the Mesa County Fair, kicked off its first show Tuesday at noon. The grizzly bear show was featured twice every day at the Mesa County Fair. Shows were at noon and 6 p.m.
Treasure, a blue-bearded silkie chicken, looks out at fairgoers Tuesday afternoon. Learn more about Treasure, at https://bit.ly/2LBxCEo. Young fairgoers stroll through the 4H/FFA small animal arena. A more traditional looking chicken, right? A variety of livestock and small animals were on exhibit at the Mesa County Fair. Mesa County Commissioner John Justman visits with 4H/FFA youth at the small animal arena. A black and white rabbit dips its paw into a water bowl to cool off. A 4H/FFA youth walks a cow before the show gets underway. Did you check out the 4H/FAA animals at the Mesa County Fair? 4H/FAA youth play while they wait for their show to begin. The Bear Hollow Wood Carvers make a bench at the Mesa County Fair. The Bear Hollow Wood Carvers made a bench in front of a crowd Thursday morning. A toddler plays with tractors in a sandbox at the Mesa County Fair. Mesa County Public Health Environmental Health Specialist Regina Clark conducts a food safety inspection at the Mesa County Fair. MCPH Environmental Health Specialist Sarah Schultz checks on a vendor at the fair to make sure they are following guidelines for temporary food booths. 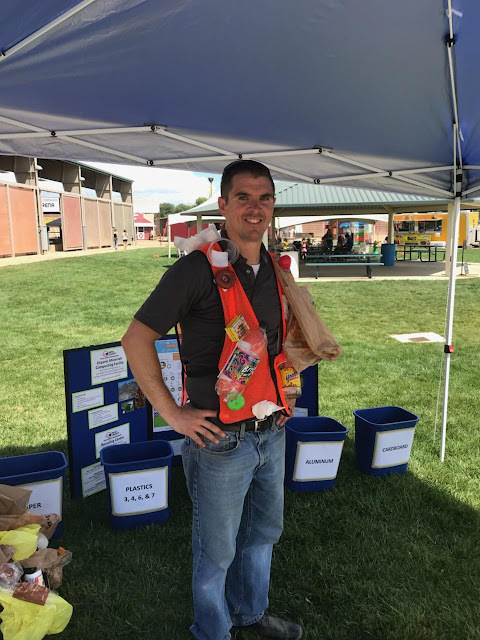 Mesa County Solid Waste Director Barett Jensen hosted a booth ("Recycle Junkies") at the Mesa County Fair to share awareness with residents about waste and ways to recycle. Regulatory Compliance Manager Ryan Kyle mans the "Recycle Junkies" booth at the Mesa County Fairgrounds. A young resident learns about recycling at the fair. Mesa County Commissioner Rose Pugliese puts on a backpack that is weighted to show how much trash the average Mesa County resident throws away in a week. Commissioner Rose Pugliese wears a backpack full of trash while Solid Waste Director Barrett Jensen talks about the importance of recycling. Mesa County Facilities Director Greg Linza drives around the Mesa County Fair to make sure everything is running as planned. Carnival rides at the Mesa County Fair. The Professional Bull Riding (PBR) event gets underway Thursday evening at the Mesa County Fair. World-class bulls and world-class riders at the Mesa County Fair. The PBR event on Thursday night had the crowd cheering. Chairman of the Board of Mesa County Commissioners John Justman looks out into the arena. From left to right: Mesa County Commissioner Scott McInnis, Rio Blanco Commissioner Jeff Rector, Mesa County Commissioner John Justman, Mesa County Commissioner Rose Pugliese and Rio Blanco Commissioner Shawn Bolton watch world-class bull riders at the Mesa County PBR Thursday evening. Mesa County Commissioners Scott McInnis, John Justman, and Rose Pugliese hold the $5,000 check to present it to the Mesa County 4-H and Fruita FFA. Rio Blanco Commissioner Jeff Rector and Mesa County Commissioner Rose Pugliese at the Mesa County Fair PBR event. Mesa County Commissioner Scott McInnis at the PBR event at the Mesa County Fairgrounds. Mesa County Department of Human Services hosted a farewell for Child Welfare Director Kari Daggett who is heading to Denver to work for the Colorado Department of Human Services. We wish her the best of luck! 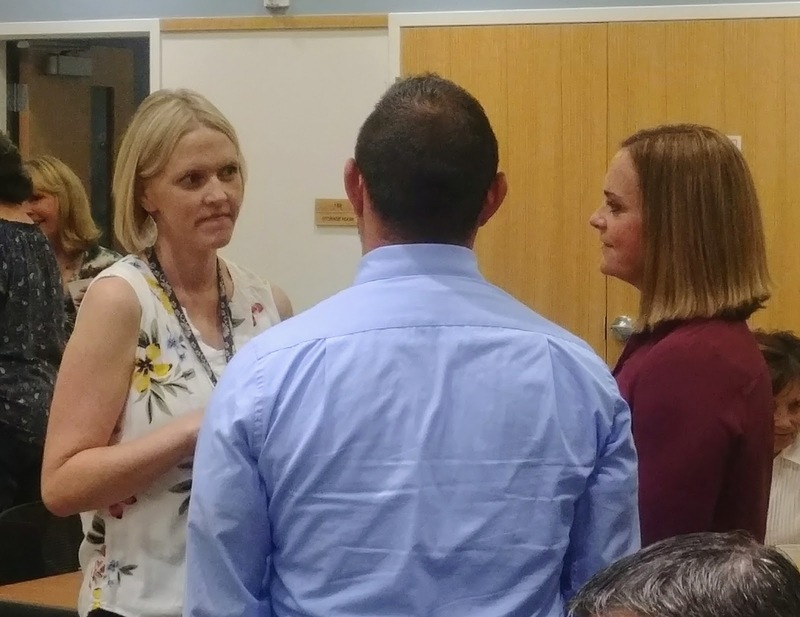 Hannah Webster, child welfare manager, chats with Child Welfare Divison Director Kari Dagget at the farewell. 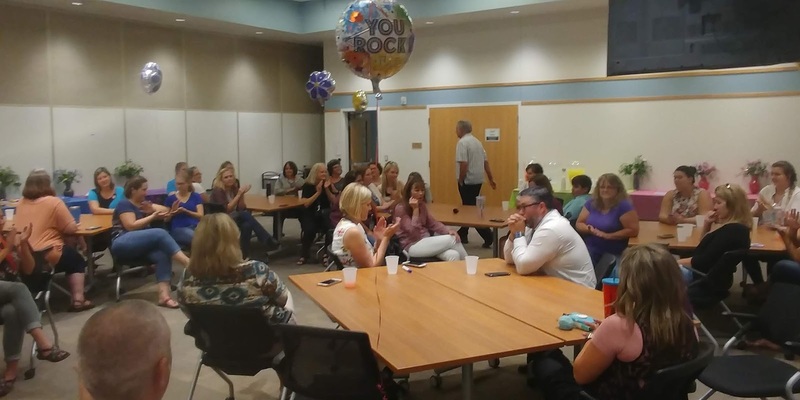 Mesa County staff and community partners wish Kari Daggett farewell. No party is complete without a big ole farewell cake! We will miss you, Kari! The Colorado Department of Human Services (CDHS) as part of their 2018 CDHS Summer Planning tour, held a town hall in Mesa County to present the state's priorities for the year and receive feedback at the local level. 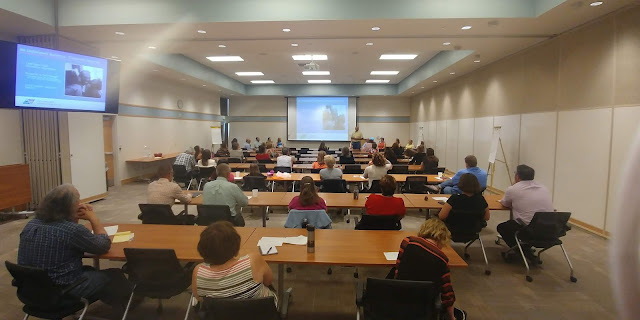 Mesa County Department of Human Services Executive Director Tracey Garchar, his staff and Mesa County Commissioners John Justman and Rose Pugliese attended the event. DHS staff members Cathy Boutilier and Lindsey Walt host a kinship foster care booth at Riverfest. 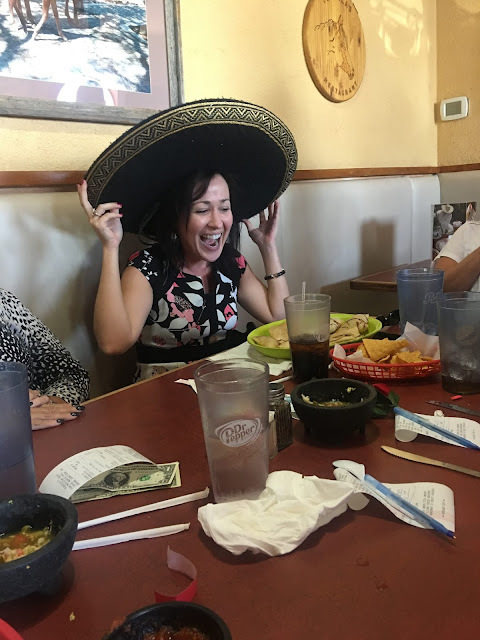 DHS Kinship Case Manager Caitlin Donohue Kinship enjoys another birthday with her team. Happy birthday!